A wonderful, clever piece, there are some really cool possibilities to an archaeology of a handful of games, this is a fabulous little example. I never expected that my two favourite worlds would collide like this. I’d been waiting to play this game for months, reading (cautiously) about it, then putting the reading aside to go back to archaeology. 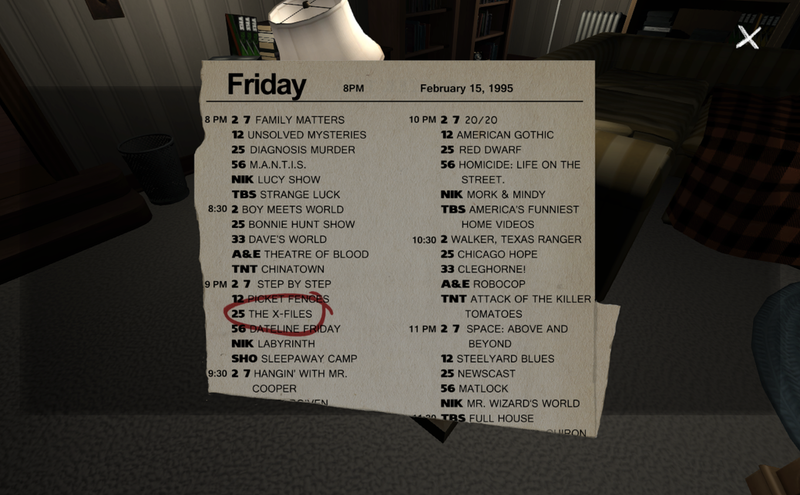 I never expected to find Gone Home here, but I was delighted to. That Sam implores you not to try to figure out where she’s gone, but that you of course do—what else would you do?—is not a very important aspect of the game. But it did make me wonder: do we often do archaeology of people who would prefer not to be ‘found’? (And, ok, perhaps Sam does in the end want to be found). Perhaps some of the internal conflicts of indigenous archaeology gets closest to this. And does the fact that we, the player, feel compelled to solve the mystery owe more to human curiosity, the degree to which we empathize with our role as caring sister, or the way in which the game essentially mechanically limits us to that route and/or plays on our familiarity with games-as-goal-sets? I feel as if these are all questions that could easily translate to the field. Relatedly, it seems that we all play this game as a certain kind of archaeologist. Because—perhaps against what I’ve just said—I do believe our primary motivation in Gone Home is to assemble a compelling story. We want to find the resonance in the detritus that Sam’s relationship has left behind, not the narrative noise of the Kleenex boxes and telephones that litter every room. We approach the game as phenomenologists and interested in the ideational, not so much as quantitative researchers interested in aggregate social behaviour. PS. Don’t you think Sam will end up in creative writing in the long run? Like a child ‘running away from home’, here the act of leaving seems like the most important part, not the staying on the road. She’ll eventually write that novel. I think too of that notion that any individual writer has essentially only one story to tell, and they spend their whole careers re-telling it. The way the makers of this game placed so many iterations of her captain’s tale around the home makes me wonder if they weren’t poking fun at this idea.